Google Plus Cover dimension has not only changed, one can use multiple gif components now. In fact this redesign in March 2013 a big change for Google Plus. The redesign is towards a more modern style, the genre of minimalistic design we are getting used with. It was really quite difficult for the designers to cleverly use the basic color schemes of old Google with the new design, but they have really worked fine. For Twitter, we actually received the new cover, which Facebook actually introduced with the name Timeline Cover. Google Plus has combined and improved the ideas from both while making the new design more smart. 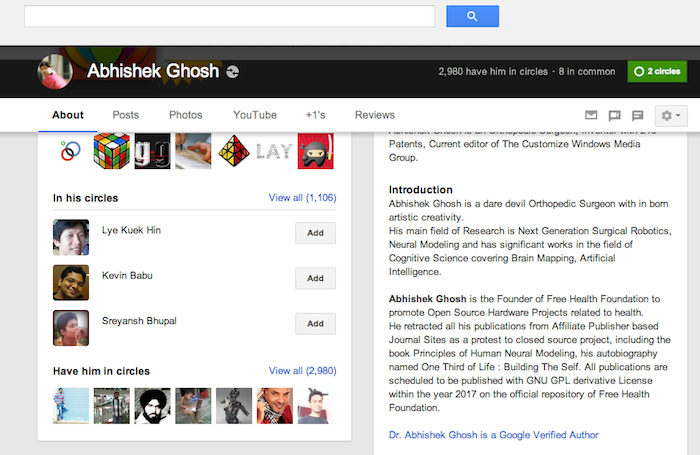 It appears that Google Plus is more interested to show the About page as default over Posts pages like before. It was an expected step. As can be seen that the Google’s branded color schemes has been used as smart looking Profile page’s About section. While the whole thing got a big redesign; somewhat towards a bit Bootstrap genre of design, the Google Plus Cover is a significant point where the Google Plus users will need to open up Adobe Photoshop. Yes, the icons are separate dom elements. We have checked with Opera Dragonfly. Although we have no idea how they have been inserted or can be used. As Mashable is claiming that Google might introduce Google Display Ads, it might happen, they are testing something new. But it is important for the users to change the dimension now. Minimum height of the New Google Plus Cover is 160 Pixels. There is apparently no pixel sized dimension mentioned (we will update with free PSD on this post, please bookmark it) in CSS, its set to 100%. So a bit calculation is needed. This Article Has Been Shared 1186 Times! Google Should Seriously think for Poor Performing Ad Serving Cloud Servers and Content Delivery Network before they can judge others’ websites’ performance. Cite this article as: Abhishek Ghosh, "Google Plus Cover For New Google Plus Design," in The Customize Windows, March 6, 2013, April 25, 2019, https://thecustomizewindows.com/2013/03/google-plus-cover-for-new-google-plus-design/.